New York is still the gift that keeps on giving. If your into Reality TV and not watching #RHONY your missing the the best reality show on the telly. The former Countess de Lesseps is back in New York after her unfortunate Palm Beach arrest and court ordered rehab. She is reflective and funny. On route to the spa, she shares her story Dorinda. She planned to stay a couple of nights with a girlfriend in Palm Beach and the rest of the holiday with her family in Jupiter, Florida. Her girlfriend had a noisy cat and she thought she would stay in a hotel for the night. She choose the Breakers where she spent time with her recent ex Tom. At or around the Breakers our Luann got wasted. AND she hooked up with sounds like a former hook up and took him up to her room which was on the fourth floor of the hotel. The drunken Luann pushed 3 instead for 4. Hey the hookup didn’t know. and she walked into a room that the maid had just refreshed. Security was called, but Luann wasn’t budging, this WAS her room. The police was called…….. and she charged with battery on an officer, disorderly intoxication, resisting arrest with violence, and crimes against a person. She wants to maintain a low profile and just be with the girls who are excited to see her,she is not drinking. Luann’s arrest in Palm Beach has resulted in interest of Tinsley arrest in Palm Beach on the internet. The BIG NEWS was Ramona. We all knows she likes a party. We learn that Ramona tried to go to Tom’s (Luann’s recent ex) New Years Eve slash Birthday Party in Palm Beach while her girlfriend was in rehab. When the ladies learn of this, they are pissed. Ramona defends herself in Ramona style. Her defense is, she dated Tom before Luann and when Luann dated Tom (who also dated Sonja) and Luann didn’t tell her so her actions were justified. Ramona is also one of those people who takes pictures on her cell and quickly uploads them on the net. So she has the wait staff take a picture. It doesn’t occur to her, Luann is avoiding the press and trying to be on the low. But now, there is she just a couple of days out of rehab. all smiles as she nervously awaits sentencing and her picture is on the net. Sonja Tremont Morgan gets on Dorinda’s every nerve! This time is over the Morgan family crest on Sonja’s shoe. Sonja isn’t a Morgan and she ain’t been married (yes, I said ain’t been) to her ex in over a decade, but who cares? Dorinda does, so its another installment of he’s your ex husBIN! and but husBIN is dead. What are your thoughts about Ramona and Luann? 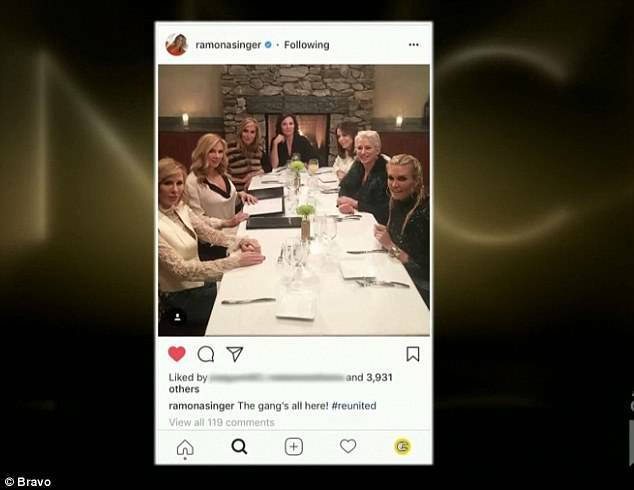 This entry was posted in Entertainment, Real Housewives of New York(RHONY), Reality TV, Televison and tagged Bravo, Luann De Lesseps, Ramona Singer, Reality television, The Real Housewives of New York. Bookmark the permalink.